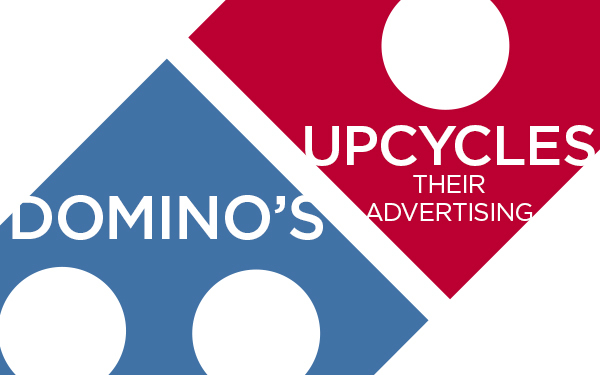 Someone at Domino’s Pizza deserves a little pat on the back or at least an “Ahh, I see what you did there.” Changing a logo and re-branding a company the size of Domino’s can be a disastrous undertaking if not handled properly. You always want to show that your brand is fresh and cutting edge, while not changing the brand so much that no one recognizes it anymore. Then, of course, there’s the process of getting every sign, print ad, shirt, truck panel and pen logo changed out. So what do you do with all this old, outdated stuff? A lot of companies will ship some helpful items to a 3rd world country, let employees take some things home or just have the old items destroyed to make complete way for the new brand image. Domino’s gathered several notable and skilled startup artists and launched what they call “Second Hand Logos” on their Pinterest page. The team of artists and “upcyclers” were given old brand materials – signage, clothing, banners and even pizza boxes – to construct unique pieces of art and furnishings to display in their galleries and on the Pinterest site. Items like scarves, blankets, side tables and wall art can all be bought directly from the artists through links on the page and you can even watch some videos showing the projects from start to finish. I realize this is a PR stunt that saves them money and keeps their logo (old and new) around longer, but the originality is there. A popular pizza company with a red, white and blue logo that’s been around since the 60’s probably has just enough pop culture power to look good in art. Not to mention the upcyclers did a pretty good job. I have to give props to Domino’s for supporting the arts and doing something unique at the same time. There’s also something to be said these days for using Pinterest in a more constructive way than sharing recipes. The stunt gathered some low-cost advertising for Domino’s and also distracted some people from the brand re-haul. Was this stunt just an Andy Warhol rip-off or an effective use of resources? What do you think?